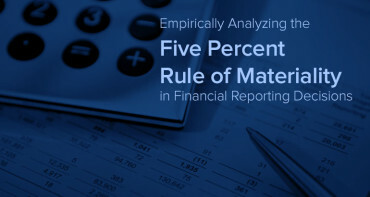 This study analyzes a sample of financial restatements from 2011 and 2012 as a way to assess a proposed “five percent rule of materiality” for financial reporting decisions. Such a rule claims the average investor is only influenced by income restatements greater than five percent. Market reactions are observed through stock price, volume, and bid-ask spread following the restatement in the Form 10-K/A. The study finds only some firms restating net income by more than five percent experience statistically significant reactions in two of these metrics.